Ben & Jerry’s is taking its hippie reputation to the next level or, at the very least, maintaining the significant hippie reputation it already has. 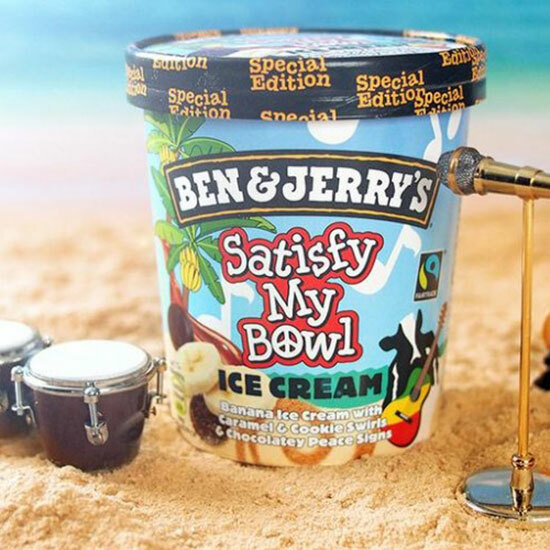 On September 15, the ice cream company will start selling a Bob Marley–themed ice cream. The not so subtly named Satisfy My Bowl (that’s a pot reference, Mom) will celebrate the 30th anniversary of Marley’s classic album Legends. The good news: The banana ice cream with caramel, cookie swirls and chocolaty peace signs sounds tasty enough to satisfy anyone’s munchies. The bad news: It’s only coming to the United Kingdom and other parts of Europe. But for any Marley fans wanting to get up and stand up for their ice cream, a petition has been started online to bring it to the US. All proceeds support the Marley family’s 1LoveFoundation and the Partners for Youth Empowerment, so you can indulge without guilt…you know, minus the “getting high and eating a pint of ice cream when you probably had better things to do” guilt.